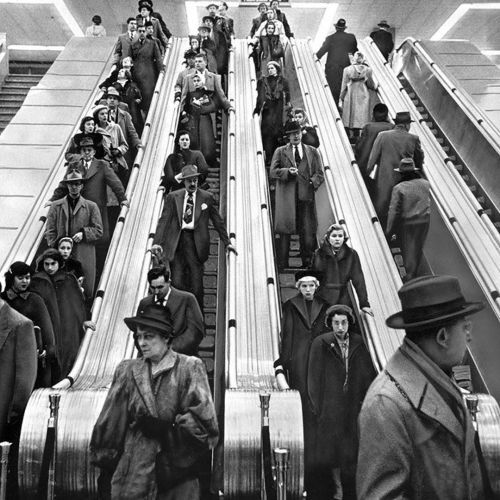 "Commuters went up — and down — escalators inside the Port Authority Bus Terminal in November 1951. Last week, two years after talk about replacing the main bus terminal in #Manhattan began, the appointed leaders of the #PortAuthority of New York and New Jersey admitted that they still do not have a plan. But they appeared to agree that the worn-down, 65-year-old depot in Midtown needs to be replaced. The @nytimes staff photographer Jack Manning took this photo of the then almost-new bus terminal in November 1951. #tbt" By nytimes on Instagram.